Part - Time Stock Lead - Riverwalk (New Orleans, LA) at Under Armour, Inc. The Stock Lead is responsible for maximizing the store selling potential by effectively training and supervising Stock and Sales Associates on all back of house merchandise handling processes. The Stock Lead assists the store leadership team in ensuring the stockroom standard operating procedures (SOP) is flawlessly executed and the store achieves brand standards for shipment processing, replenishment, markdowns and merchandising. The Stock Lead is expected to model Under Armour’s Core Competencies and I WILL behaviors in all actions and interactions in order to maintain a positive Teammate and Athlete experience. Communicate clear priorities and productivity goals to Stock and Sales Associates and hold team and self-accountable for achieving them. Communicate all employee accidents/injuries to store leadership immediately. Maintain and support safety standards on sales floor and in the stockroom; communicate safety concerns to store leadership. Support store and company level strategies to reduce shrink; observe and monitor for signs of shrink and advise store leadership of any unusual internal or external activity. Convey any shipment related concerns or issues to store leadership. Support the store leadership team in driving flawless execution of the stockroom standard operating procedures (SOP) to ensure efficient and effective processes in order to maximize productivity and sales. Lead efficient and effective shipment processing by making sure associates are following processing and placement guidelines and achieving units per hour productivity expectations. Inform store leadership of shipment and stockroom fixture supply needs. Perform audit and transfer of damaged and defective merchandise. Responsibility for the organization and cleanliness of all back of house areas to include Lundia’s, Supply area, Teammate break room, and restrooms. Provide feedback to corporate business partners on any shipment/delivery discrepancies. Lead role in training, developing, and coaching Stock and Sales Associates on the merchandise handling skills needed to consistently achieve merchandise productivity standards for shipment processing, replenishment, markdowns and merchandising. Provide store leadership with productivity updates; proactively identify and communicate feedback on Associate performance. Coach associates when productivity expectations are not being met, and provide performance feedback upward to leadership team. 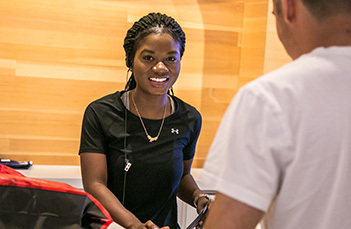 Drive teammate engagement by recognizing and rewarding teammates for their outstanding performance in delivering to Under Armour’s merchandise productivity standards. Understand and adhere to Under Armour’s visual standards in order to maximize merchandise presentations when flowing product from the stockroom to the sales floor. 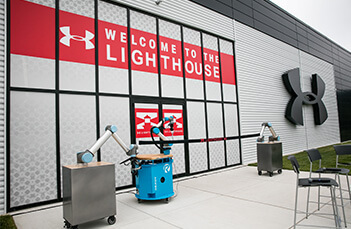 Communicate merchandising opportunities to store leadership as identified through replenishing size specific quantities throughout the store: recommend and execute merchandising adjustments in compliance with Under Armour visual standards. Oversee and execute markdowns and re-ticketing in the stockroom and on the sales floor; update store leadership on compliance. Minimum 1-2 years of stock experience preferred. Team leader experience preferred, but not required. Strong prioritizing, interpersonal, problem&dash;solving & planning skills. Demonstrated excellent time management, organization skills and attention to detail.